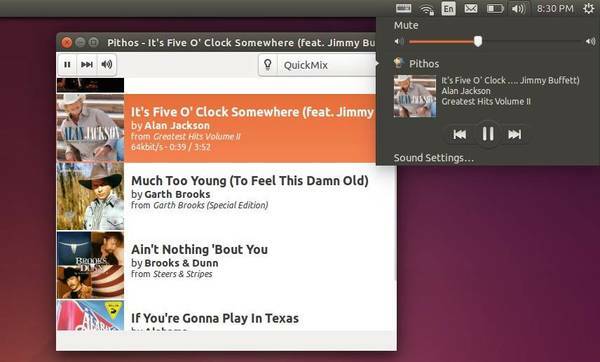 This tutorial shows how to install Pithos, a native Pandora Internet Radio client, in Ubuntu 14.04 or Ubuntu 14.10 via its PPA repository. Pandora Radio is a music streaming and automated music recommendation service which is only available in the United States, Australia and New Zealand. The service plays musical selections of a certain genre based on the user’s artist selection. Pithos is an open source Pandora Radio client for Linux. It’s much more lightweight than the Pandora.com web client, and integrates with desktop features such as media keys, notifications, and the sound menu. The latest release has reached v1.0.1, you can get the detailed changes from the github page. The developers have created a PPA repository that provides the latest packages for Ubuntu 14.10, Ubuntu 14.04 and their derivatives such as Linux Mint 17. If you don’t want to add the PPA, grab the .deb installer directly from the launchpad page.